Amitabh Bachchan ‏got emotional on his way back from Shivaji Park, where Bal Thackeray's last rites took place on Sunday. 'Mumbai was never, ever, in my 45 years here, been as quiet, disciplined and peaceful, as today !! BalaSaheb put to the elements .. 2 million on the streets walk along his cortege, in respect and in grief .. never before such !!' he tweeted. 'Salutations to the Shiv Sainiks, for maintaining a deserved protocol of dignity to the departed leader ... and salutations to the Mumbai Police for an incredible 'bandobast' ... not a corner unguarded .. polite and helpful service ! And during rituals at the pyre, the holy chants and the prayers, in the midst of 2 million mourners, pin drop silence ! Amazing !' he continued. He also said Thackeray was close to him: 'The silence from the 2 million gathered at Shivaji Park during the last rites, demonstrated two things - the respect for Bala Saheb Thackeray and secondly the deep ingrained culture of the Maharashtrian ... 'sanskaar' !!! Yes Bala Saheb, I would like to believe, was close to me, and never had I imagined that I would live to see his motionless body !! 'As I drive back from the funeral, two poster images stir an emotional chord. One : the word 'Swargiya' before Bala Saheb's name .. And Two : A poster of a rudraksha mala around a chest, the thread broken and a rudraksha seed falling away. Caption : 'mala tutli'. Bala Saheb wore a rudraksha mala around his neck and hands ... today the thread that bound all the seeds, broken,' he added. 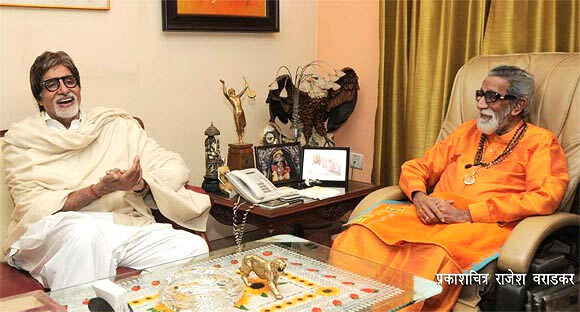 Filmmaker Ram Gopal Varma looked back at his association with Bal Thackeray. 'can't evr forget the hug the real Sarkar gave me when he saw reel Sarkar...Bala saab was a true epitome of power in every sense of the word. Mumbai is synonymous with Bala saheb...Will not be the same now that he is not there,' he tweeted. 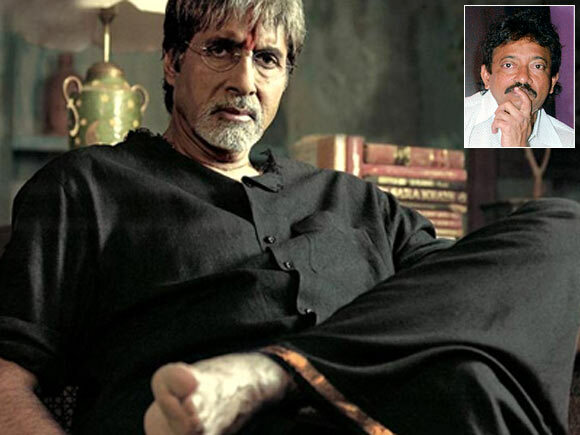 RGV said that he would not have made Sarkar if Thackeray wasn't there. 'if Godfather was not there i wouldn't have made sarkar..if Bala saheb wasn't there I couldn't have made Sarkar. Bala saheb would have been the only people's leader in the world who is so non hypocriticl that he gave an interview while having wine. was sitting nxt to him watching sarkar at Rajkamal theatre uddhav was to my left and raj was to his right holding his wine glass and chips,' he continued. The filmmaker also said he copied Thackeray's lines for his film Sarkar. 'He actually told me 'mujhe jo sahi lagta hai main wahi karta hoon! ' which I copied and made Amitji say in Sarkar. Many of the dialogue from both Sarkar and Sarkar raj are actually Bala sahebs lines which i copied from what he said!' he added. Actress and former Miss Universe Sushmita Sen turned 37 today. Sen is in Dubai with her daughters Renee and Alisah to celebrate her birthday. 'It's Birthday time beautiful people!!! :))) Thank you soooooo much for your wishes and blessings..In Dubai with family celebrating life:))' she tweeted. 'I loooooove u all for always having given me the strength to be myself..I celebrate you all tonight!Thank you!! Mmmuuuaaaah:) b'day girl ;)' she added. After completing her film Ishqk in Paris, Preity Zinta is on holiday. 'Off 4 a break away frm everything & every1 that reminds me of work! My 1st real break in 2012. 5 days of work n 1 week of Nature! Yessss :-)' she tweeted. Meanwhile, Neha Dhupia returned from her short break. 'Heading back to #mumbai after a short break! I hear #aalllizzwelll' she updated.